A reference for trigger points and referral patterns for 108 muscles. Features 160 trigger points with their corresponding referral patterns, 80 conditions that can be caused by trigger points, and 25 videos that show how to release specific muscles. Each muscle includes the visual referral pattern and point location, plus a written muscle action, referral, origin, insertion, nerve, comments, and audio pronunciation for each muscle. You can choose to view each muscle individually, or use the zones view to see all the muscles that refer into a specific area (or for a specific condition). This is a great help in discovering the source of pain. This app features all the scientifically proven trigger points and referral patterns as shown in the research. 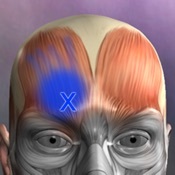 Trigger points are tight places in a muscle that cause pain to be felt elsewhere in the body. This is great for massage therapists, physical therapists, chiropractors, or anyone wanting to discover the source of muscular pain, and learn about muscle function. FEATURED IN APPLE'S WHATS HOT FOR TWO WEEKS!